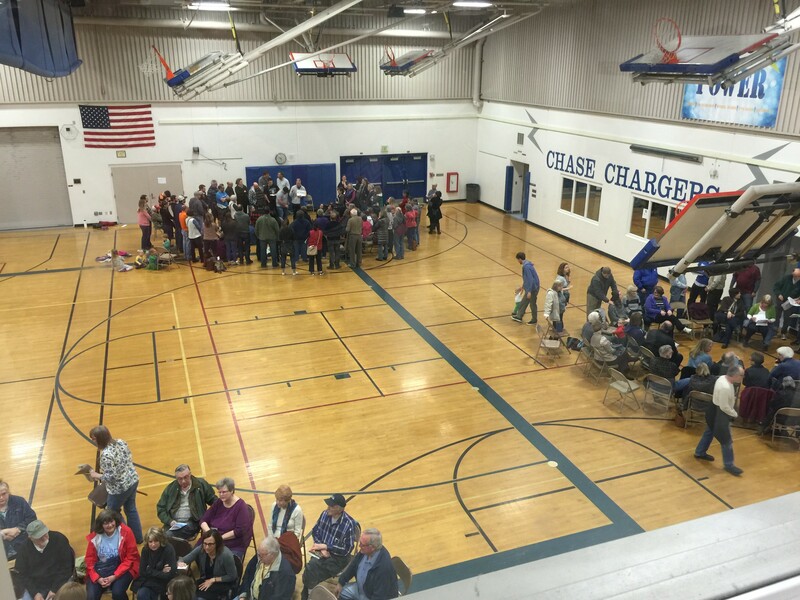 The scene inside Chase Middle School for the Democratic caucus. The first sign that it was going to be a Bernie kind of day was the traffic jam on 37th Avenue, heading to Chase Middle School on Spokane’s South Hill. With their ample parking lot already full, Subarus with “Coexist” bumper stickers turned up into the neighborhood to park. Anne and I found a spot four blocks from the entrance to the school and joined the migration of that elusive species that comes around every eight years — the Eastern Washington Democrats emerging from their hidden nests to Caucus. Coming over the rise and looking down on the school, the lines were out the door — a swarm of citizens who cared enough to spend their morning debating politics. Maybe it’s all the alarming talk coming out of Trumpworld — the GOP poked the bear, and the caucus was the first chance for local Dems to roar back. Or maybe we really are feeling the Bern here in the ’Kan. Whatever the reason, the lunchroom at Chase was jam-packed. I was there eight years ago when Barack Obama won, and I’d say the 2016 crowd was four times larger. We started with an initial vote: Hillary Clinton, 17; Bernie Sanders, 19. Then it was on to discussion, with each person given a chance to orate away. Clinton is a huge part of the corporate problem in America, one argued. Where is her money coming from, anyway? Sanders is too far to the left, another countered, and he’s got zero management experience. Some liked his idea for a revolution; others were a little freaked out by it and wanted more gradual change. A few more people had joined us in time for the final tally; nobody switched candidates. Clinton won 18 votes, while Sanders tallied 22. After we finished, the 6233 commiserated a bit, but I had to ask the elderly woman, who stood through the entire caucus, if she remembered the first presidential candidate she ever voted for. “Oh, I don’t remember,” said Phyllis Everest, who turns 97 in two weeks. 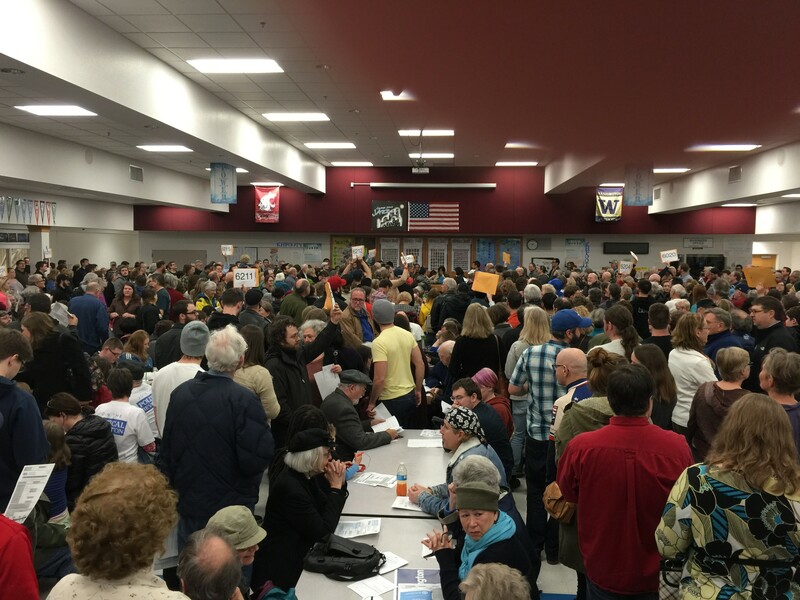 The caucus experience is invigorating — so much more democracy-affirming than filling in a little bubble and mailing off your ballot. You’re sure to feel a lot more hopeful about this depressing election cycle than you did when you woke up in the morning. 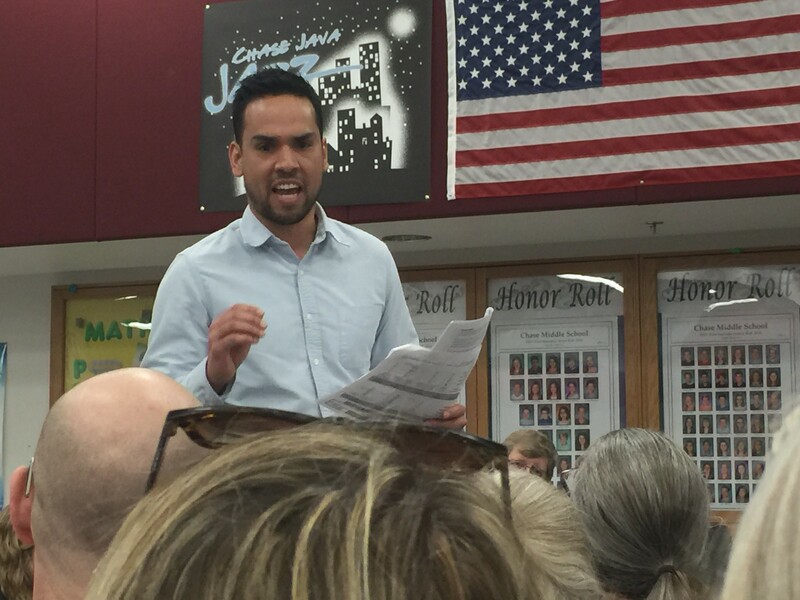 After our group broke up, we spent time listening to speakers from other precincts, and hearing locals articulate their support kind of crystallized it all for me. The difference between Sanders and Clinton is the difference between idealism and reality. Reality is kind of a bummer; idealism, meanwhile, is fun, cool and drives turnout. No surprise, then, that early returns have Sanders crushing Clinton here in the Evergreen State. There were lots of young people participating. I talked to one young Bernie supporter from Seattle, home on spring break from college, whose mom is for Clinton. I came away thinking, really, if you’re young and you’re not idealistic — aka, for Bernie — there’s probably something wrong with you. I was young once, and I see a lot of Jimmy Carter in Bernie Sanders. Morally righteous and inspiring, Carter was, in the end, ill-equipped for the demands of the office — problems abroad overwhelmed him, and he was a one-termer. Soon the talk at the caucus turned to how Democrats could maintain unity and keep the other camp in the fold after one candidate wins the nomination. They’ll need to keep the energy going, and the majority of it is being generated by the Sanders movement. Not everyone agreed: One semi-angry young man climbed up on a table and barked out how it was Bernie or nothing for him. He would never vote for Hillary Clinton. Phyllis Everest didn’t speak on behalf of her candidate, Hillary Clinton. She just listened politely and smiled, enjoying the clash of ideas. 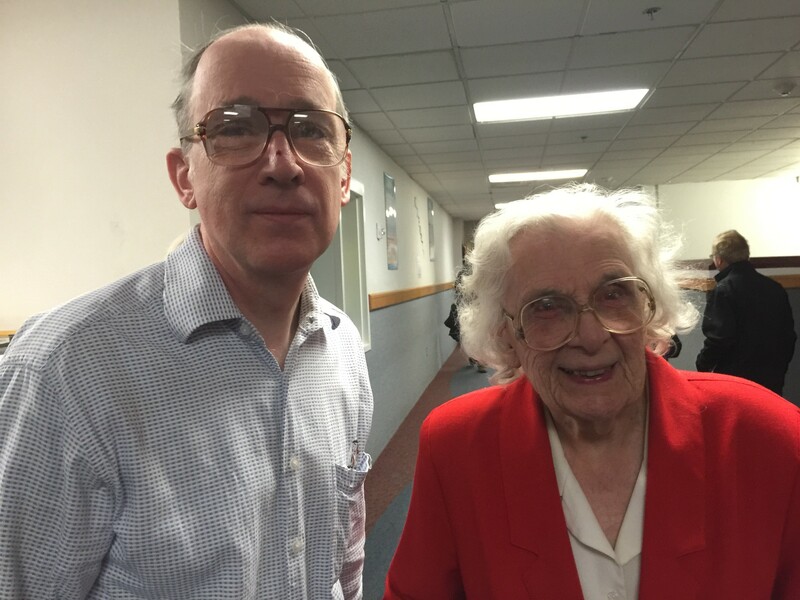 But just by getting to Chase Saturday morning, at the age of 96, she was sending a message about who really is in charge of America’s future. The city released data on its sit-lie ordinance. Here's what we learned.